Plochmann Lane: Celebrate Halloween w/ Connor Kennedy @ Bearsville Theater!" 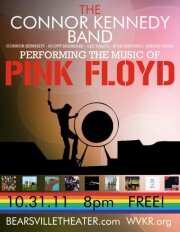 Celebrate Halloween w/ Connor Kennedy @ Bearsville Theater!" Connor,Lee, Scott & Jeremy & friends were amazing !!! Connor & Lee are old beyond their years. They give new definition to the term C H O P S !!! Jay Collins gig coming up!